Choose from our quality range of paving slabs, kerbs, stone and timber in a range of types and sizes, plus essential aggregates for landscaping and garden work including sand, gravel, stone and mulch. Our team are always on hand to advise on what products would work best for your project. 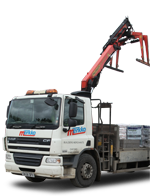 With can deliver your order to any UK location, with free delivery if you are based within 50 miles of Abingdon.